In adult vomiting occurs due to food poisoning, any infection, illness or motion sickness along with high fever. Different stimuli can cause vomiting to occur. These stimuli ranges from kidney stones to migraines. Sometimes it happens that after seeing someone vomiting can cause other to start vomit at the same time. 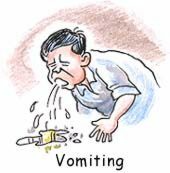 Vomiting is not a disease itself but it is a symptom of many diseases, vomiting and diarrhea being supporting symptoms of different diseases. Headache and vomiting commonly occurs in migraine.